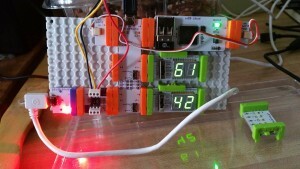 One of my active projects is a temperature and humidity monitor based on littleBits and a DHT22 sensor from Adafruit. Currently, the project actively monitors the temperature and humidity and displays it on two number displays. Eventually, the project will do those things, plus report those values to the cloud, turn an oscillating fan on or off, and report the fan power state to the cloud. I would also like to add data logging to a local web server as a capability somewhere down the road. Once I get the code for the Arduino cleaned up, I will add it as an update in a future post. You can find out more about all my projects via my Projects page. I will be adding a littleBits page and associated projects as time permits. Hi, nice project – I am doing something very similar and wanted to know what the littleBit wire does from the coudBit out into the arduinoBit in. Thanks for your insight and for this post.